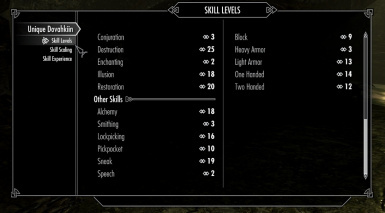 This mod allows you to randomize your starting skill levels, manually set skill levels and customize skill scaling with the MCM. Fixed issue with the lover stone check. Cleaned up the experience script a bit. Added the experience page and options to set experience levels based on starting skill levels. Fixed the random roll specialized skill slider. Fixed info text on the Skill Scaling page. 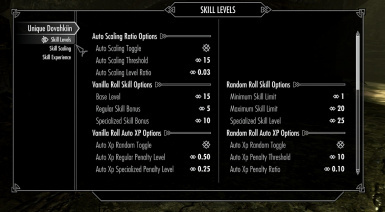 This mod allows you to randomize your starting skill levels, or manually set them and customize skill scaling with the MCM. I recommended that you use this mod with a new character, as it could change the way you build your character's skills, though you can use most of the features from this mod on a current play-through. This mod has the "Cheat" tag as well as the "Balanced" tag because depending on how you use the mod it could make you really overpowered, or could make you underpowered. Your game balance is up to you. In short, this will buff your skills based on your skill level and the ratios set in the MCM. For example, if your Destruction skill is at level 20, and the ratio is set to 0.5, your destruction spells will be 10% stronger. If the ratio is set to 1, your destruction spells will be 20% stronger. You can also have these set based on your starting skills if you randomize them. More info below under Skill Levels. This works by adding spell buffs to your character, and managing the spells' magnitudes. It works the same as if you drank a potion to buff a skill, which means it should be compatible with everything. Also as scaling is ratio based, you will continue to see increased buffs above level 100 if using Skyrim Community Uncapper. For compatibility you can set a wait timer for when you level up a skill. Default is 30 seconds. So, when a skill levels up, the mod will wait 30 seconds, allowing other mods to do their thing before resetting and re-applying the scaling buffs. Make sure to select the Recalculate option after setting new ratios. If you don't, the new buffs won't be applied until you level up a skill. If you set all ratios to their max value of 2.1 this WILL make you overpowered. 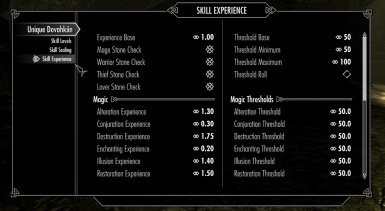 Here you can modify how much experience you gain from performing skill specific tasks and set a threshold level for when it takes effect. Vanilla is 1.0. If set to 2.0 that skill will level twice as fast. If set to 0.5 it will level twice as slow. If set to 0 that skill will be capped, you won't be able to get any experience from that skill once it reaches the threshold level. Example, Let's say you set Destruction to 1.25, One handed to 0.5 and Smithing to 0 and leave their thresholds on 50. Once the skills reach level 50, Destruction will level up 25% faster, One handed will level 50% slower and Smithing will be capped so you won't be able to increase its level at all. You can also have the experience levels automatically set based on your starting skill levels if you randomize them. More info below under Skill Levels. You can randomize the thresholds, set all of them to the same level, or set them manually. Set the thresholds to 0 to have the experience modifiers take effect right away. Note that this feature uses perks with a high priority and will override perks from mods that do the same thing. 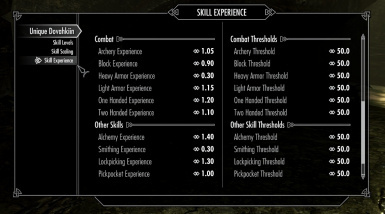 If an experience level is set to 1.0 the perk for that skill won't ever be applied to you character, and so won't conflict with other mod's perks. Mods that change your base leveling stats without using perks are fine to use with this mod. Also, in the MCM you can set whether or not the mod checks for the Lover Stone, Mage Stone, Warrior Stone or Thief Stone, which also uses perks. If checked then the perks from this mod will be adjusted to reflect the bonuses those stones give you. When you activate a stone you will receive a stone from this mod called Unique Dovahkiin Stone Check. Don't remove this stone from your inventory or the bonuses will be removed. If one of those standing stones is already active, uncheck the stone which is active, and check it again in the MCM after changing experience levels to have the bonuses applied. In here you have the option to randomize your starting skills. There are two options for randomization. Only use the Rolls if starting a new game. Wait until after you have chosen your race and named your character. When choosing this roll, all of your skills will be set to the Level Base (which you can customize), which will negate your racial skill bonuses. Then it will choose 5 skills at random to apply the regular bonus to, (which you can customize) and 1 skill to apply the specialized bonus to (which you can also customize.) So, if you leave it on the default values 1 skill will be set to 25, 5 skills will be set to 20, and the rest of the skills will be set to 15. If the Auto Scaling Toggle option is checked, the ratios in the Skill Scaling page will be automatically set for the skills that have bonuses applied to them, based on the auto ratio and the skill level. 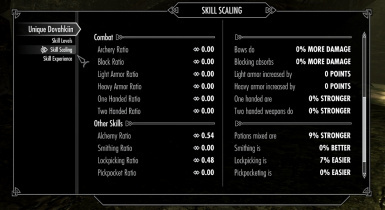 So, on the default settings, the skills that were set to 20 will have their scaling ratios set to 0.6, and therefor will automatically get a 12% buff to start out with. I added this feature so that the skills you have bonuses in, and therefor are more talented in, will be more effective than other skills as you level them up. If the Auto Xp Random Toggle is enabled, the experience levels on the experience page will automatically be set. It will set 5 skills to the Auto Xp Regulary Penalty level, and one skill to the Auto Xp Specialized Penalty level, which will level slower once their levels reach the threshold on the experience page. The skills that have regular bonuses will have their experience levels set to the Auto Xp Regular Bonus Level, and the skill that has the specialized bonus will have its experience level set to the Auto Xp Specialzed Bonus Level. 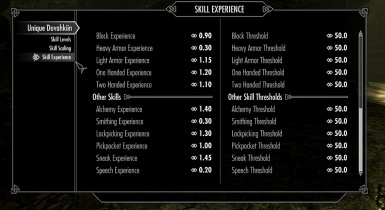 These skills will level up faster once they reach the threshold level on the experience page. This will choose a completely random value to set each of your skills to, between the minimum and maximum amounts you have set. 1 random skill will be set to the specialized skill level you have set. If the Auto Scaling Toggle option is checked, then any skill that is equal to or above the Auto Scaling Threshold will have their Skill Scaling ratios automatically set. Any skill that is above the Auto Xp Bonus Threshold will have their experience levels automatically set based on how much above the level they are, and the Auto Xp Bonus Ratio. This will display all of your current skill levels. Here is where you can cheat. You can manually set any skill level to any value between 1 and 200. Only set above 100 if you are using Skyrim Community Uncapper! Note that manually setting skills, or randomizing them will use Setav to change your skills. Here you can save your randomization parameters to a FISS preset. 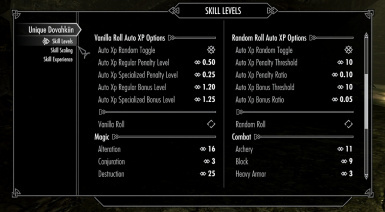 This includes your vanilla roll, random roll and threshold roll settings. If you save this preset, it will automatically load when you start a new game, so no need to load it manually. 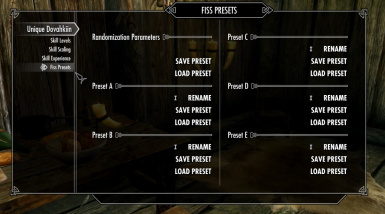 You also have 5 different presets that you can save. By default they are named Preset A, B, C, D and E, but you can rename them. If you rename them be sure to do so BEFORE saving the preset, or the new name won't be saved to the FISS xml file. 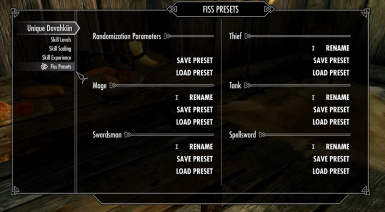 The new name for the preset will automatically be loaded if you start a new game and FISS is installed. For these presets you can save all your settings, including skill levels, scaling ratios, experience modifiers and their thresholds, or you can pick and choose which settings to save. If you choose not to save all settings, only the settings which you have chosen will be loaded when you load the preset, so you don't have to worry about the other settings being changed. 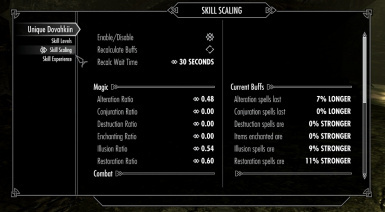 The scaling feature should be compatible with everything as it uses unique magic effects and spells. will prevent the perk from that skill from being applied to your character, and so won't conflict with other perks. FISS is required to use the presets. You don't have to use FISS though if you don't want. Extract to your skyrim/data folder and check in your load order. 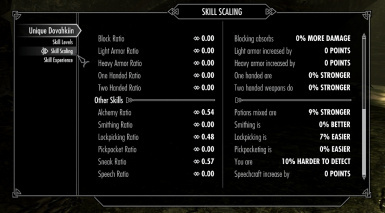 Disable skill scaling in the MCM and uncheck or remove the esp. Other than that feel free to use this mod as you wish, as long as you give me credit. I would ask though that you provide the source code of your work and offer the same freedom to other mod authors.